Hotel New Ambika International is a newly built property where you can experience hospitality at its best. It is a luxury hotel with all modern facilities. 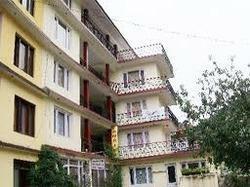 Hotel is designed in a manner so that it is in complete harmony with nature that makes a unique stay in Manali. It is conveniently located near Bus Stand and 'The Mall Road'. It offers pictursque view of Snow peaked mountainous region of the Valley. Hotel Ambika (Old) is one of the oldest property of Manali which has been maintained at its best to suit all the requirement of an esteemed guest who wants to enjoy a memorable holidays in the lap of Himalayas. You can enjoy your meal in the terrace while basking at the sun and appreciating beautiful view of Lush green grassy meadows and snow capped hills. Manali - Packages is a premier destination management company based at New Delhi, India. The company is managed by well- experienced team of experts and professionals drawn from complementary yet diverse fields of specialization pertaining to different segments of tourism trade. We cater to a vast range of clients i.e. Travel Agents, Tour operators, large corporates, multinationals, exporters, educational institutions, groups, clubs and individuals from all over India and overseas. For both Indian and Foreigners.